Built on the runway of the former Kai Tak Airport, the Kai Tak Cruise Terminal is an iconic structure centrally located in Hong Kong’s Victoria Harbor. The terminal has year-round operations and an array of amenities not seen elsewhere in the industry. Its restaurants are open 365 days, and include a 960-seat Dim sum / Chinese banqueting restaurant, Hong Kong-style cafe, Continental cuisine with local craft beers, International bar and restaurant, as well as a Kids cafe. The rooftop garden has 360-degree harbor views, and receives thousands of local visitors daily on weekends and holidays. Each month the terminal plays host to some 15-20 private and corporate events, product launches, and has an adjoining site popular for fun runs and music concerts. The terminal hosts ship calls year-round, and processed over 730,000 passengers in 2017, a 96% increase over the previous year. 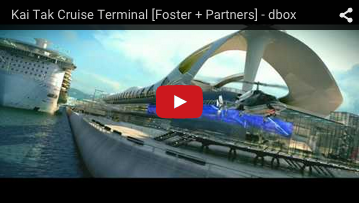 Worldwide Cruise Terminals is a consortium led by Worldwide Flight Services. For more information, please visit www.wfs.aero. The Kai Tak Cruise Terminal is an ISPS-compliant facility. Our berth allocation policy and schedule of fees and charges are available on demand for cruise lines and their shipping agents. Please see our service pledges here. Please see our management team here. Please see our incident record summary here.